Camelot. The very name summons images of knights in armor fair maidens in need of rescue, castles imposing their will on the countryside, and countless other true to life, historical romances. Let us not forget, however, Merlin the wizard, the magical sword Excalibur, the immortal Green Knight, and all the rest of the mythical elements of the King Arthur story. Was there ever a King Arthur? Historians and scholars have all but come to blows trying to answer this question with certainty, but there are a few things they can agree on with very little argument. 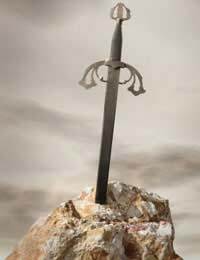 There were certainly real life inspirations that lead to the King Arthur stories, and there are parts of those stories that are firmly based in history. The Arthurian Cycle is a way to encompass the core of the tales of King Arthur, gleaned from the commonality of all the various tales. There are his beginnings as a child drawing the Sword from the Stone, as only the prophesied new King could do. There is the advice and magic of Merlin, his wizard advisor, and the magical properties of the sword Excalibur. The Lady in the Lake (mysterious guardian of the Sword) figures in the Cycle, as do the adventures of many of Arthur’s knights. The knights’ being fashioned into an organization (the Knights of the Round Table) is every Cycle, as is the mythical castle/town of Camelot. Arthur’s queen, Guinevere, and her betrayal with his best friend and champion, the undefeatable knight Sir Lancelot, are always present near the end of the Cycle. The very first narrative of King Arthur and his legend is attributed to Geoffrey of Monmouth in his 12th century writing Historia Regum Britanniae (History of the Kings of Britain), but earlier mentions of Arthur can be found in Welsh poetry. The 6th century poet Aneirin penned the Welsh poem cycle The Gododdin, which briefly mentions the bravery of a soldier, but then says he is no Arthur. Other similar “throw away” references are made of a powerful man in many poems by the name Arthur, and it is believed they all point to the mythical King. This kind of “historical” background may have lead Geoffrey of Monmouth to include Arthur in what is, despite the name, a highly embellished semi-accurate tale. In Historia Regum Britanniae readers are introduced to Merlin, who uses his magic to disguise Uther Pendragon in order for the latter to father Arthur on another man’s wife. With such a duplicitous beginning, it may seem right that the Arthurian Cycle always ends in betrayal, death, and the end of the ideals of Camelot. But also the Cycle always includes some mention of Arthur’s eventual return, keeping the dream of Camelot alive. So powerful are the influences of the Arthurian Cycle and the legend of King Arthur that in 2002 he was voted in on a BBC program as one of the “100 Greatest Britons” of all time (coming in at #51). His story, begun in poetry and myth, has appropriately been respond in a great variety of hues and patterns, each time reinforcing and spreading the King Arthur myth.